The true price of certified coffee from Vietnam is € 2,35, which is lower than conventional coffee from Vietnam. 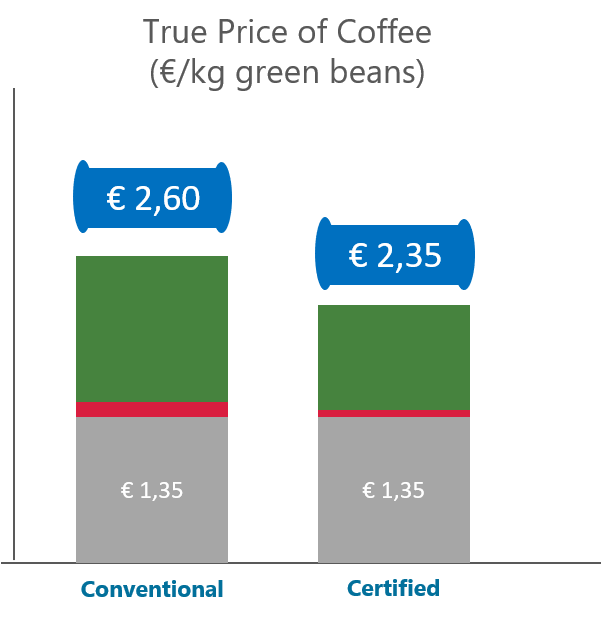 Conventional coffee has a true price of € 2,60 per kilo of green beans. We also calculated the true price of a cup of coffee which is.€ 0,12, which includes 10 eurocents for the retail price of coffee and 2 eurocents for the external costs. Description: True Price executed an extensive impact measurement and valuation project for coffee in Vietnam, a value chain where IDH executes sustainability programs. The study compared the social and environmental costs of conventional vs. certified production. The study attributed impacts on farm and retail level.